The heavens opened this afternoon and we had a deluge. All this rain makes a change! Whilst walking around the local area I've noticed the occasional 6 foot white pole with what looks like a yellow and black stripped pitched roof on top. There’s also a disused oil distribution terminal rail siding just down the towpath. It has an abandoned look but still has an intact perimeter fence and working video surveillance equipment. One of the local ‘live aboard’ boaters believes the cameras monitor his movements and there’s something sinister about the facility. It’s some type of secret base! I’m more inclined to believe it’s merely a disused siding and the surveillance cameras are on pre-programmed movements which just give the impression they are following your movements whilst walking adjacent to the perimeter fence. The cameras appear to have an IR capability! Everything started to appear more logical when on a walk I came across the GPSS facility at Padworth. It’s located on the top of a ridge to the south of the canal. The white poles with the coloured tops mark the location of the underground petroleum pipes. My guess is the rail siding is; or was; linked to the Padworth GPSS depot. Top arrow is the rail siding and the GPSS depot the bottom arrows. 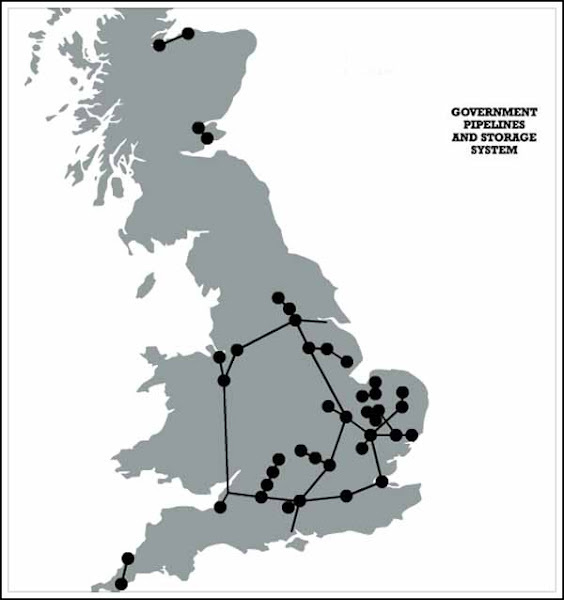 The GPSS is the Government Pipeline and Storage System. It was built by the government during WW2 to store and distribute light petroleum products for PLUTO (Pipeline Under The Ocean). This was the fuel pipeline that ran across the English Channel and followed the Allied armies. There are almost 2500km underground pipelines around the UK linking various refineries and military facilities. 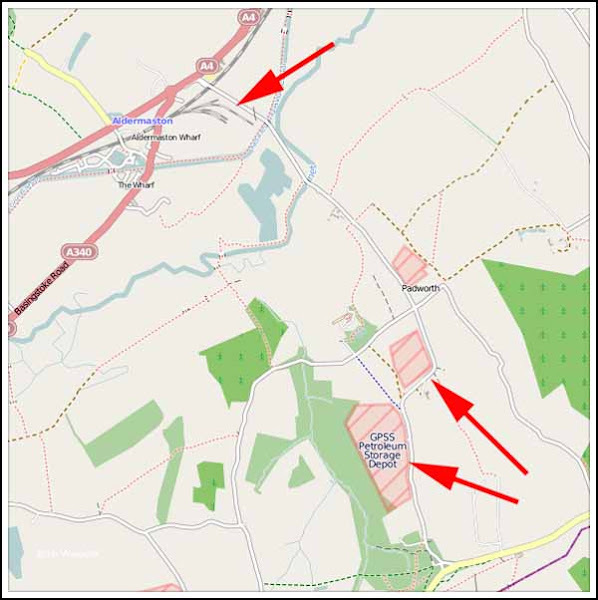 GPSS supplies fuel to the adjacent AWE (Atomic Weapons Establishment) and probably supplied the US Airforce base as Greenham Common when it was operational. The GPSS isn’t exclusively used by the military and apparently the government is encouraging more commercial use of the network. It’s possible to see the extent of the GPSS pipeline on the Linewatch website. 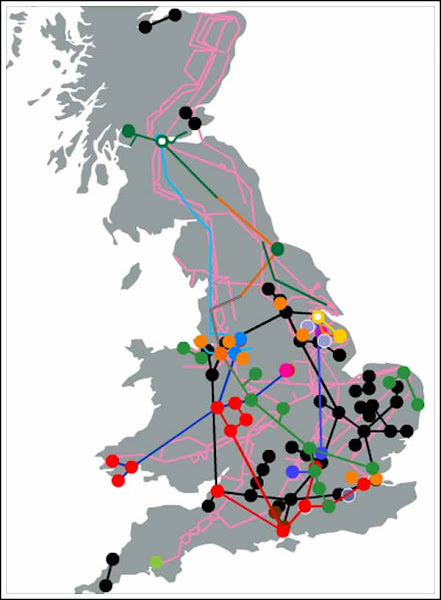 The entire UK pipeline network. The government pipelines are shown in black and light purple whilst all the other pipelines are owned by petroleum and gas companies. Makes you think about what’s under your feet and how there could be a disaster if an excavator dug in the wrong spot! Does that include the Depot at Islip just north of of Oxford ? When first married we lived in Woodcote (Wayside Green) & when walking the dogs in the early hours on a quiet night you used to be able to hear the fuel being pumped to RAF Benson. The house deeds didnt allow any "disturbance to the soil" 20' either side of the pipeline which ran through the estate. You are spot on with your deductions I think. I work for Essar UK LTD (formerly Shell) at the Stanlow Ellesmere Port refinery. Part of the pipeline you speak of is known by us as the UKOP Pipeline (United Kingdom Oil Pipeline) and we use it to pump all sorts of fuels including aviation spirit all over the UK. We did indeed use it during the war to supply airfields around the UK. Here is a bit of info for the geeks within us ( and more boring fact for Jan). It takes fuel 2 weeks to travel from Ellesmere Port refinery to Heathrow airport having traveled at a sedate 4 miles per hour. Andrew, I struggle to find Oxford on the map! OK.. it's somewhere in England. Alf, I would have been too frightened to dig the vegie patch if I could hear the fuel! You might be right that the cameras are tracking you! 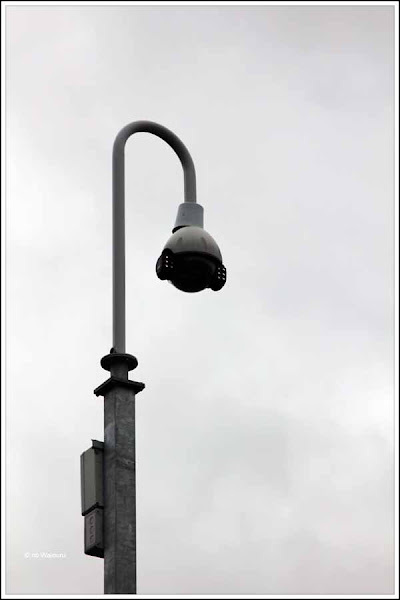 We had a system at work some years ago that had PIR detectors which sensed body heat and turned the cameras towards the area where the body had been detected. And some more info on the GPSS - the Droitwich Barge Canal has a pipeline under it at Hawford - the restorers didn't realise it and did some work over it which had to stop PDQ when the authorities found out. It was eventually finished under close supervision by the pipeline people. Peter, I suspect it's unlikely that the camera is actually tracking me. They appear to be on a set pattern and move in a timed sequence. I'd be surprised if the cameras were being monitored. The siding is rusting away and overgrown. But then I've erred in my judgement in the past! Re using narrowboats, they did actually :-). Research a boat called Towy. She shipped Diesel from Stanlow to Manchester up until 1950 and is now owned by Cheshire heritage centre teaching children what life was like on the cut in those early days. That will teach me to make flippant comments!